Using Raspberry Pi for your IoT experiments - a given. Like the white hair on my head. Well, instead of loosing your night’s sleep read this. I had published one gist some time back. But, like my head it has grown white hairs(Obsolete). Recently I started setting up my (now old) Raspberry Pi 3. Retracing the steps, helped to get some security insights. Creating a safer IoT gateway thats valid with today’s updates. Let’s first look at the Linux image used for this experiment. Desktop Rasbian (Debian with spices) is a typical choice. That’s the location find the image to download. Albeit confusing - Desktop there is two versions ! Should work with any Raspberry Pi 3 and above. Should work with any Raspberry Pi. Well, a word of caution against old Raspberry Pi’s out there - They burry the berries up in UK. It would have been nice if we could use this - Lean, Mean Machine!. Raspbian Stretch with desktop and recommended software - Has desktop GUI, with lots of kinds toppings. Not Recommended for IoT folks. Once image downloaded, use a writing tool to flash it to a microSD Card. It’s an easy no fuss tool. After this you can boot the Raspberry Pi with microSD Card. Then setup the pi account password to begin. It’s best if you got WiFi setup done. No problem, we would also look at that here. It’s easy, just knowing the right files to edit. Editing this file would help you setup the WiFi from Command line. Note: Here we are looking at a WPA2 pre-shared key type WiFi network. Even with invisible network SSID, scan_ssid=1 can work out. Also note country=IN setting, to limit our Raspberry Pi WiFi to country specific bands. This would reload WiFi configuration and start the network. That would ping the Google DNS and should work all the time. The pi account has access to sudo command. And it does not ask password. That’s not a good idea. This would make sure that using sudo command under pi user would ask for account password. Don’t forget to reboot the Raspberry Pi after these modifications. Lets make sure that we have all the shields up! We would need to edit the network configuration to prevent intrusion. Save and then reboot your Raspberry Pi. Then above rules would get applied. Note: With this setting avahi daemon would stop working. Means you would not be able to access the Raspberry Pi with hostname.local type of URI. First we need to enable SSH. We can do this in two ways. Might get some more idea about SSH setup. It might not be directly applicable here. First and easiest solutions one can suggest - changing the SSH port number. By default its 22, you might like to change it to some other number. I am bad at remembering things. I would leave it Port 22 for now. Please do go ahead, if you think it helps. One might enable StrictModes if one is too paranoid. For multiple users you need to add them to AllowUsers. Similarly the DenyUser would bar user account from ssh. We add an additional file /etc/ssh/global_authorized_keys. This helps in case you have multiple users. The full sshd_config file. Make sure to rename the file to sshd_config in case you would like to replace the original file. Also check the permissions on the file. Else it would not be loaded during server start. I started key generation following the github tutorial. Eventually deviated and here is the result. ssh-keygen -f .ssh/rpi_key -b 4096 -C "your_email@example.com"
This command would generate a rsa4096 in the .ssh directory. It would generate 2 files. Note: Execute this in the HOST PC not on the Raspberry Pi. Copy the public key .ssh/rpi_key.pub to a pen-drive. Then copy it over to your Raspberry Pi in a temporary location. You can remove the pen-drive after this. In the above sequence the file is copied to your user root directory. Next we need to insert this as authorized key. The last line is optional. In my case pi would be the only for all purposes. Also I have one Host PC. Hence inserted the key to even the global level. That’s it you have comparatively secure SSH. Watchdog for Raspberry Pi : Unattended Reset ! Using a watchdog is great for coming out of a Hang or stop situation. Next we would look at how to enable and use the Raspberry Pi’s built in watchdog. The name of the watchdog driver is bcm2835-wdt. With this setting the Watchdog would reset after 4 seconds. The package fail2ban has come a long way in support of multiple threat prevention. It not only protects upon SSH, also works on nginx, apache, mysql, mogodb .etc. I am refraining from any modification in configuration of fail2ban. As, there are not updated resources on this. You can still refer to the older version if you need. One can find out if they have missed fire-walling any ports on the network. Fill up your external IP and then run the test to see. This can help you find out if your Raspberry Pi can be accessed from outside. Typically your router would provide a way to isolate and bock ports. One can also do that using a firewall installed in your Raspberry Pi. 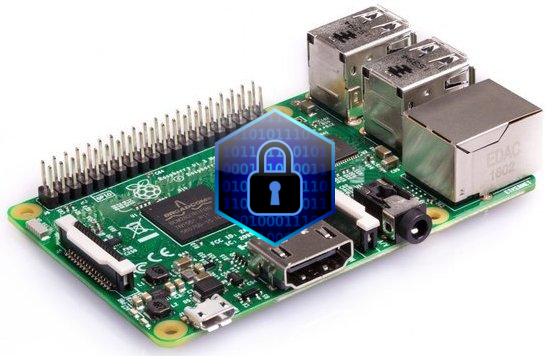 These are still only a few things one can do to secure the Raspberry Pi. As I find more tricks, this article would get updated. Though we are talking of securing Raspberry Pi, but method described in previous sections is still vulnerable. One must use hardware key store or HSM modules like YubiHSM for better security. At any point if the Private key is compromised in the above process due to weak password, no-password or direct Hacking the whole network security to the Linux is compromised. WARNING: This free document / guide is for your convenience and its use is at your own risk. It is available as a reference only, and IS NOT INHERENTLY A SECURE WAY to connect to Linux. The author/providers cannot and do not guarantee the privacy of your data, its security and communication. There are potentially serious security issues with any computer connected to the Internet without the appropriate protection, ranging from viruses, worms and other programs that can damage the user’s computer both ways, to attacks on the computer by unauthorized or unwanted third parties. By following this guide, you acknowledge and knowingly accept the potentially serious risks of accessing your hardware unsecured over network. It is recommended that users take steps to protect their own computer system, such as installing current anti-virus software and maintaining appropriate firewall protection. You acknowledge and agree that YOUR USE OF THIS DOCUMENT & ABOVE PROCESS IS SOLELY AT YOUR OWN RISK.